guaranteeing customer’s smiles from the first to the last click! With Mister Fly you will take on all the challenges of worldwide travel and work among the biggest Travel & Tourism players, being part of a team for a growing Travel Agency that has already helped over one million customers to travel around the world! With Mister Fly, Webhelp offers you the perfect opportunity for a bright career in the Travel & Tourism sector. We are looking for someone who is in love with travelling the world who can use their experience, creativity and intuition to help guide customers in planning the vacation of their dreams. Fair and regular assessments for positions like: Quality Specialist, Team Leader, HR Recruiter and many more. Discounts at gyms, restaurants, beauty centres, pharmacies and many more businesses in the area. 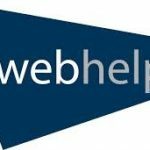 By joining Webhelp Portugal, you will integrate a growing company where you can find fair and real career development opportunities. More than your experience or credentials it’s your personality and motivation that will push us forward.